Welcome to Surf Camp San Diego! Located on the sprawling coast of America’s Finest City, San Diego is the backdrop for the birthplace of Southern California surfing. 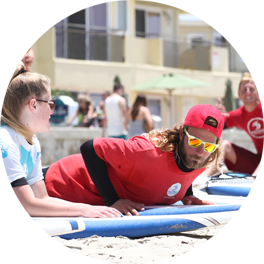 Our highly experienced surf coaches develop a personal program catering to your specific skill level. Focus is directed to each individuals surfing style, strengths, weaknesses and areas of needed refinement. In addition to top tier surf coaching we also provide many other services and amenities in our inclusive packages. Prepare yourself for five-star beach front accommodations, healthy meals, photo and video review, daily yoga, stand up paddle boarding, bike and sunset tours, and most importantly private massage. 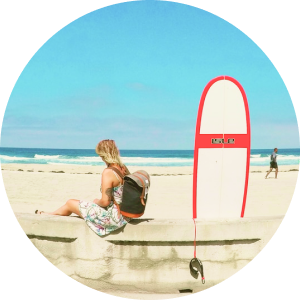 Surf Camp San Diego is passionate about sharing our lifestyle and our culture in a relaxed and friendly atmosphere. We strive to provide excellent service and unforgettable memories. Our staff is dedicated to making you the best surfer you can be using the latest training techniques and theories. Enjoy activities that we, as locals, appreciate and utilize in our daily lives. 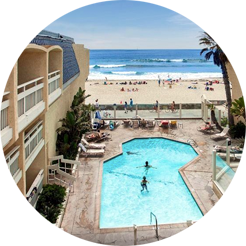 The goal is to deliver complete immersion into our active, fun and desirable California lifestyle with the highest quality beach front accommodations at your fingertips. Come share the stoke with us! Read our TRIP ADVISOR reviews..